the dusk zone: My Favourite Things... Tag Time! My Favourite Things... Tag Time! Hope you are all well darlings. Also hope you have a spare hour or day to read/view this post because it is heeeeeavyyy. But light. Long too. Like a wholemeal spelt baguette. Or a Kanjeevaram silk sari. Warning. Brevity is not my forte. I was tagged by a semi-recently discovered and already favourite blogger - Veshoevius from The Taxonomy of my Wardrobe. ...now I am very bad at these things, I don't always play, I don't know why, it's not like I don't like talking about myself (ha!)... just lazy I guess... but I got rather excited about this tag! Until I started doing it. These questions, seemingly so innocent, so innocuous, so... insipid really... are the devils work!! They are hard to answer!! Well, for me anyway. I got excited because Veshoevius made it all look so easy. Her answers are so lovely , eloquent, evocative and so 'visual', her post is presented so beautifully that I got inspired and excited! Mind you I felt all that before I actually saw that I had been tagged! A little bit about the blogger/tagger... a very intriguing woman... she is a Flamenco dancer as well (but far more advanced than I)... as you will see, her writing is very 'visual', very 'voluptuous', a multi-faceted personality, sensual, practical and she is an enigma. Not just because she doesn't show her face. 1. Why did you create the blog? "My blog is the result of the way I dress, not the other way around. My family, friends and colleagues have always looked forward to seeing what I wear everyday and I always receive compliments from strangers. Particulary because of the all the colour I drench myself in. I have had my dress sense and sensibility from childhood. Tavi schmavi. The child-as-fashion-genius phenomenon doesn't amaze me. I grew up in Madonna and Cyndi Lauper times. People who work at opshops and vintage markets I haunt save 'special items' for me. Apparently I inspire women to "experiment". Still trying to figure out if that's a good thing... oh and... I've had women nudge each other or their partners, point and snigger at me. A friend sent me a link to site called Style Diary and I thought that was a splendid idea and wonderful way for non-famous people to showcase their individual style! I am over magazines and media telling me that celebrities are the last bastion of style. No they are not and I.don't.care. I don't follow celebrity style. The idea of dressing like someone else repulses me anyway. I was once described as dressing like Carrie Bradshaw (plus being a journalist, comparison was inevitable) and woah no! I existed first and I was a sports journalist. So there. I guess, like most bloggers,reading other blogs inspired me to jump on the blogwagon. Actually... every blogger I know says this, even the uber famous ones like Sea of Shoes' Jane and Style Bubble's Suzie. ...makes me wonder who was [pause for dramatic effect; cue sfx. electronic reverb] The First Style Blogger? I did also notice the lack of women my age, which puzzled me. Now I know better. I think it's important that women my age and older showcase their fabulosity 'til it is truly seen as the norm. What I do find hard is the chronic chronicling! I was never a diary/journal keeper. It's not my 'thing' to write down thoughts and musings. Get this.. I did try and keep a diary once but found myself writing for an audience! Ha! That is actually the pressure that may make blogging a chore... having to write for an audience. I must confess, if I was to write for self, they'd be a hell of a lot of swearing going on!! I believe style is a physical manifestation of our psyche. It is self expression and how we perceive ourselves and others and how we choose to present ourselves. I may have created the blog to share my spirit but I think now it's mainly about photographic creativity." "Hmmm... I follow many blogs and they're all different. I don't just follow style bloggers and style blogging isn't what makes me a fan of the blog. There are many popular style blogs that, well, bore me. And I don't neccessarily follow like-styled bloggers. Not everyone thinks like this though. I read blogs and like the style of bloggers that (I know) faint at the sight of all my colour and layers! Australian bloggers in particular, seem to have a fear of colour! Not all and certainly not my favourite Australian bloggers! I read somewhere that when we commend someone else on their taste we are actually congratulating them for being like us!!!! I don't like that. I don't like someone simply because they're like me. How boring. Where's the diversity? I comment and follow and LIKE/LOVE many blogs/bloggers that have very different taste/style to mine. I like uniqueness. Individuality. People who are not afraid to not fit in. And wit. And a knack for storytelling. and prose. and fluidity. 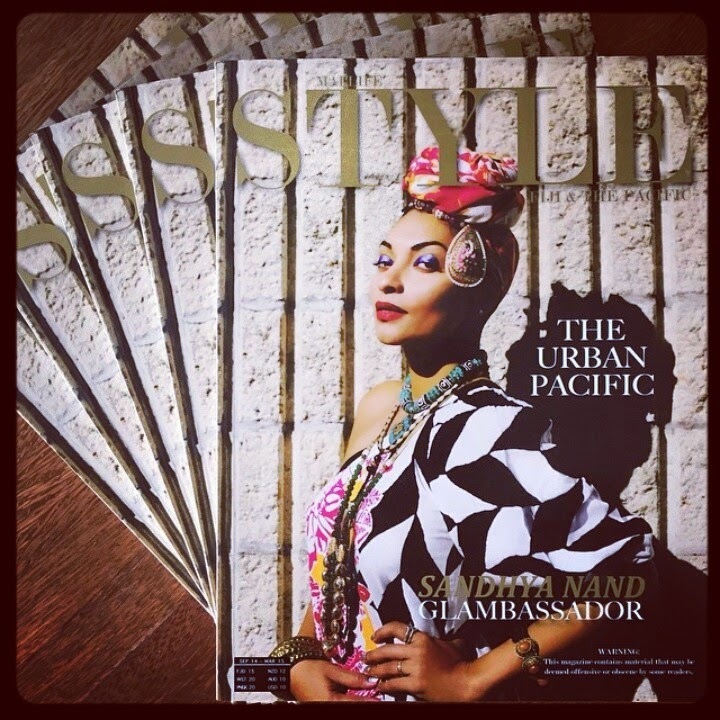 elegance, sassiness, strength. Wit though, hooks me everytime. and certain women just rock a Goddess vibe you know? I know what kind of blogs I don't follow! Blogs like The Sartorialist and Jak & Jill bore me. Particularly when they photograph famous people hanging around fashion weeks wearing the equivalent of a third world country's budget. Yawn. Although I do love the gorgeous stylings of Sea of Ghosts, Suzie Bubble and Gala Darling, etc... they don't thrill me as much as say, a 'normal' blogger does... someone like Vintage Vixen or Tanvii or Fourth Daughter....not world famous but gaining recognition for being fabulous individuals who don't depend on labels to validate their style." "Don't have one. I really don't place much value in brand name of cosmetics. Having said that... in my twenties, I was in to my branded cosmetics - Sonia Rykiel, Elizabeth Arden, Chanel, Estee Lauder, Clarins, Lancome, Shu Uemura, also Revlon and Poppy King lipsticks (Australian brand, the best matte lipsticks ever). Now... I don't really care what brand I wear, as long as I love the colour and the feel. But mostly the colour. And the price. I know. I'm such a cheapskate!! But... quality no longer comes at a price. I believe it never has, not cosmetically. Departments stores and cosmetic chainstores are treasure troves! I don't wear foundation. When I remember (!) I use the most amazing powder product ever! I will do a seperate post on my skin stuff okay? I am however, obsessed with mascara! L'Oreal, Maybelline and Bourjois have the best ones not because of the mascara but because of the variety of brushes they have! It's all in the brush and flick of the wrist. 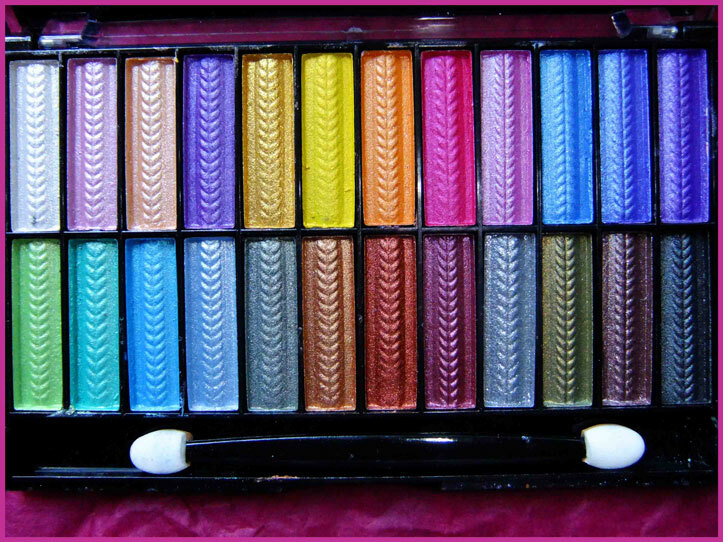 ...am also rather obsessed with eye make-up... have just bought this palette of rainbow deliciousness and I am itching to play! Again... do not have one. Regular readers will note/know/have read that I very rarely (rarer than hens teeth) state the labels of the garment/s I wear. My attitude is 'I Maketh..'... as in the clothes don't make me... they way I wear them makes them.. I shop everywhere and wear everything. I relised long ago that I don't view fashion as an investment. Puhlease. What a myth. Don't get me wrong... I do have many designer names in my wardrobe and I do love designers but... I don't salivate over things like Lanvin for H&M or wax lyrical about Rodarte. A garment is too often mistaken for fashion. Fashion is too often confused with style. eg. wearing Wang leather shorts makes you fashionable and stylish. No. Just means you have money to burn. And a bum for a billboard. Not girth! Advertising. Where's the mystery? But dammit those shorts are gorgeous!! For me clothing is not art. It is the application that is the art. Not what you wear. HOW you wear. "Lip balm or lipstick. 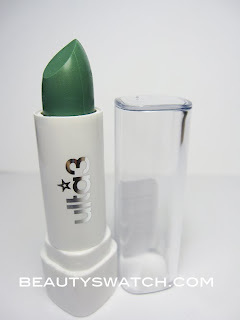 Any lipbalm and mainly Ulta 3 Green Magic... a pharmacy brand [AUD$3] green lipstick that turns pink on your lips! The higher your alkali levels the deeper pink it becomes! It is moisturising and creamy and it lasts forever!! It was the lipstick type/brand I used when I was 13. And I'm still using it... how's that for staying power!!! I also use M.A.C. lipsticks, 'Viva Glam' and 'Carnal'. Found the most perfect red in a cosmetic chainstore and it is now 'my' red." Totally mood dependant. Last week it was wavering between pink and red. That's my masculine energy coming to the fore. When my oestrogen is asserting her kickass self, then it's blue, like this week... which I know sounds topsy-turvy considering people believe that blue is for boys and pink is for girls. Pink was originally for boys...If you want to know why, ask me and I'll tell you in the comments section. Blue was considered the paler, daintier colour. The gender switch in the Western world, happened some time after WW2. I am also personal shopper/stylist and I don't work using trends, I use moods and colours. 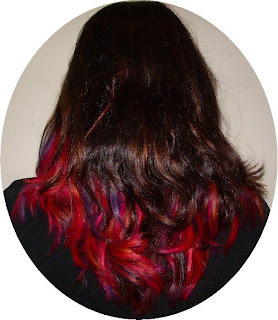 My hair used to be like this and then after this, it was teal and cobalt tipped. About 5-10 years ago. I want my hair teal again but alas... everyone's doing it. 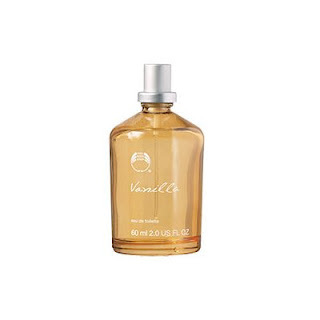 "Vanilla Oil and Vanilla EDT by The Body Shop. Cannot choose this. I have a huge collection of movies -English, Hindi, Chinese, Some French and Spanish- and I love them all! Favourite genre would be sci-fi. No. Action. Female hero action. Thrillers. Horror. No not really. Not anymore. Definitely martial arts films and supernatural stuff and sci-fi fantasy and mystery and twists... The Dark Knight and LOTR and Indiana Jones and Bond and Lara Croft and Star Wars and The Usual Suspects and North by North West and Rear Window and Sholay and Karz and Khoon Bhari Maang and Matrix and Seven Samurai and Kill Bill and My Best Friend's Wedding and Austin Powers and Game of Death and Mortal Kombat and Charlies Angels and anything by Pedro Almodovar and Bend It Like Beckham and The Long Kiss Goodnight and Face/Off and Contact and Gattaca and Rocky and Die Hard and League of Their Own and cripes I'm tired now. "Spain. Japan. 2 cultures I am fascinated with and by and I have never visited these countries. Oh I have visited Spain once when I was a child living in England but that doesn't count. ...I'd love to retell a story that a beautiful Flamenco dancer winked at me whilst performing and forever my heart belonged to Flamenco, etc, etc but alas... no. No wink. But something stayed. 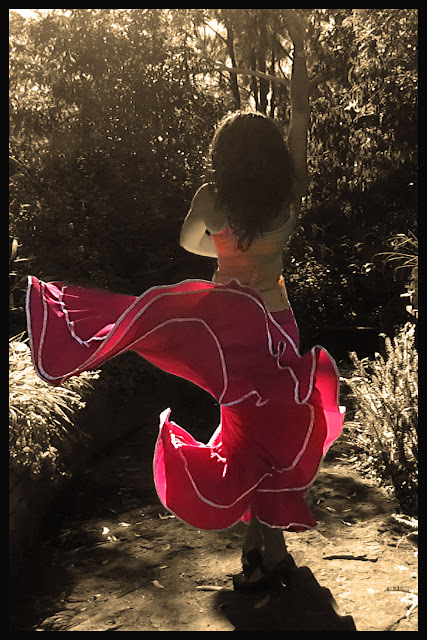 I have been fascinated by Flamenco my entire life. Likewise Japanese culture and traditions. Taiko Drumming resonates deep within my soul. 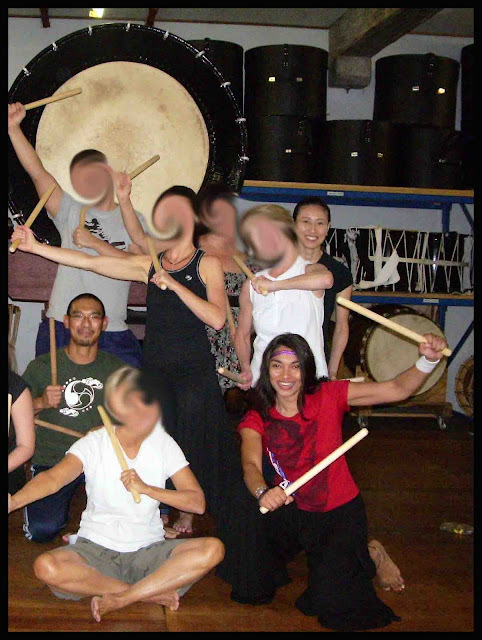 This is the only image I have of me in the Taiko dojo. That big drum is Odaiko. Respect. ...I need to revisit India... and revisit USA...and spend months driving/sailing around them... my husband and I intend to do this... we're boating people and it is our wish to one day, when the youngest has finished his schooling, to sail around the world. 10. To be chosen by the blogger. Please! Take my finger instead! Okayyyy, let's talk cars. What gets your motor running? Oooh. That's more like it. I love cars and motorbikes! I love working on cars. Have rewired Jaguar engines... we love our Jags... and am very proficient at changing brake pads on Land Rovers and water pumps and filters and spark plugs, etc. This is my dream car. Alas... it is only a dream. 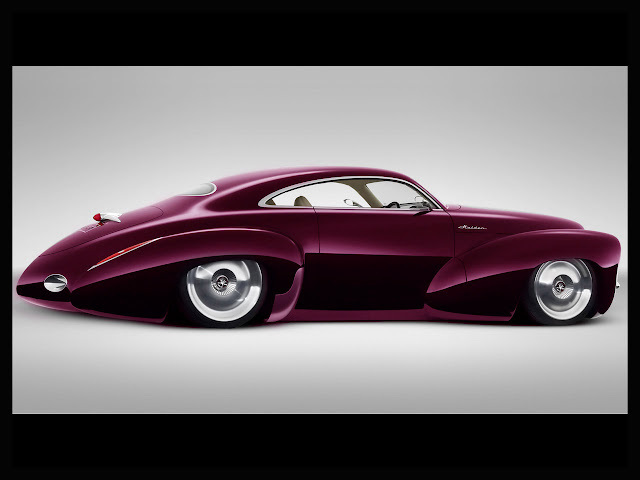 A prototype concept car. The Holden Efijy. I used to ride this. I now I want this. Oh Dusk, I adore you. You write from the heart, there's no facade, no illusions and no pretence and you are absolutely captiviting, eloquent and beautiful. My man always appears behind my shoulder when I'm reading your blog and now he knows you can tinker with an engine I think he's totally in lurve. Ps Thanks for the mention! I'll bite. Why was pink a boy's color? and it was great to learn a little more about you, and I definitely agree its hard to describe a style, pick a favorite book, song or movie. When I do not know how to articulate I just use this phrase. I feel it sort of culminates everything. I think I know you from my previous life! The orange and blue.. gorgeous! and pink was guy's color ?? i want to know..
hahaha I loved reading all your answers!!! So you're a journalist? I should've guessed considering you write SO well! Do you read a lot? What kind of books do you like? And why was pink first for boys ;) someone had to ask! thanks for your gorgeous comments. could you *be* any more sweeter? you are gorgeous and I love all the colour you put into your outfits! What fabulous answers and beautiful pictures! Love the rainbow eyeshadow pallete. Great to read more about you. I totally agree with you about older women needing to showcase their "fabulosity" (love that word). When I first started blogging it seemed that older (hah! OLDER sadly meaning over 30s) bloggers were very hard to find is a crying shame. Since then I have managed to find some cracking ones though but I still feel they are under represented and probably because they are frankly too busy juggling work, family and lives with responsibilities they didn't have in their teens and twenties. Love this: "I am over magazines and media telling me that celebrities are the last bastion of style. No they are not and I.don't.care." And so impressed you ride motorbikes - I'm just a fake biker chic who wears imitation gear churned out on the high street and rides pillion. You however ARE a real biker chic! You get to shop clothes for other people - that must be fun! Interesting you chose Spain and Japan - did you know that the biggest market for flamenco in the world is Japan? The Japanese are CRAZY for it! Hola lovelies and...awww shucks, thank you! I am humbled and seriously amazed that you read through this absolutely jumble of transcribed thoughts!!!! Okay, just quickly.... pink was originally for boys because pink is a variation of red... red... blood... blood when it sprays out of the body particularly in war, either through swordfighting or gunshot, it's a pink mist...but that's NOT the only reason why pink was traditionally for boys. I will actually write my next post about this because I was wearing an outfit today [Tues 30/11] that perfectly depicts this!!! A Batman t-shirt with a hot pink logo, vintage hot pink pleated schoolgirl skirt and armour/artillery belt and studded booties... !!!!! Forgot to write what the bikes are... the first bike is a Suzuki Across 250...loved this bike mainly because of its rear fuel tank and front helmet storage area! was a perfect bike wor women! 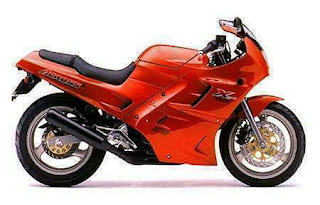 ...I actually had 2 other bikes but they weren't mine, I just rode them. 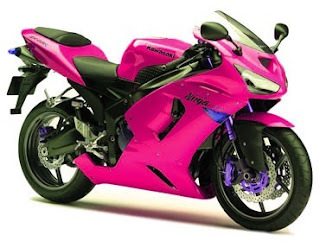 The dream bike is a Kawasaki Ninja. @ Prutha - you? a "dumbass"???? NEVER. and hardly. Colour is just my 'thing' hon. 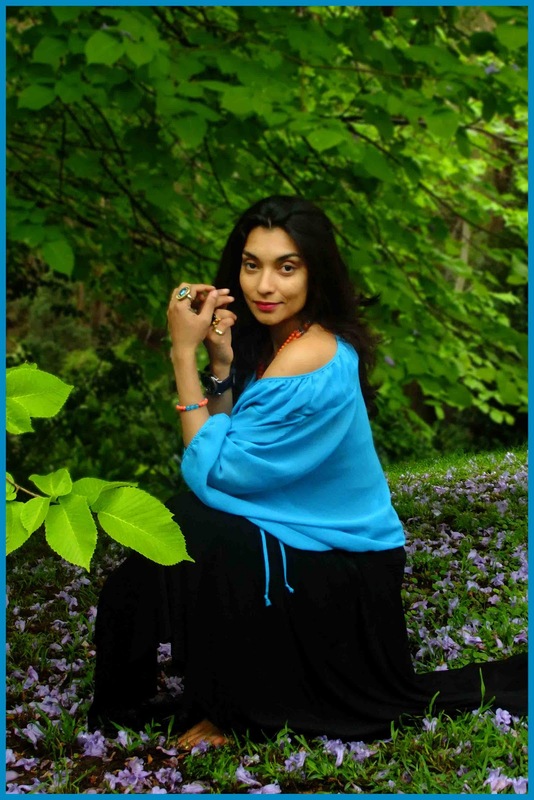 since childhood when I first started doing yoga and learning about the chakras and the colours associated with them... I am heading towards becoming a chromatherapist... I know that it is possible, indeed...fact, to change left/right brain patterns with colour. ...I dress my clients according the the colours they NEED rather than want. Low brow, high brow, I don't discriminate. @ Veshoevius - I didn't know that about the Japanese! I was a biker chick, now I'm a hypocrite because I refuse to let my daughter ride. Not happy that my sons do but they've been riding since they were kids and when we were living in a 'safer', traffic wise, country. Daughter will go and do it anyway (she's a legal adult) but I refuse to teach her. The comment you left on my Mint Condition post... that is EXACTLY what I meant to say!!! Forgot to say it because I went off on another tangent as per usual! That whole "should be grateful" thing. i don't really fancy that shade of blue but it looks really good on you. Nah, I don't think we congratulate others on their taste because it's similar to ours. 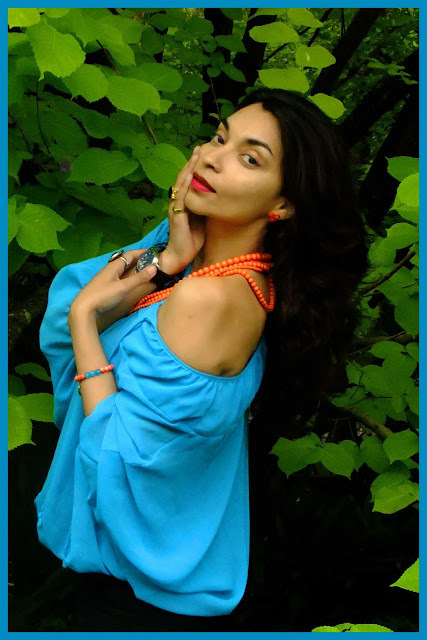 I love coming to your blog because you dress totally different than I do - just take this blue blouse... 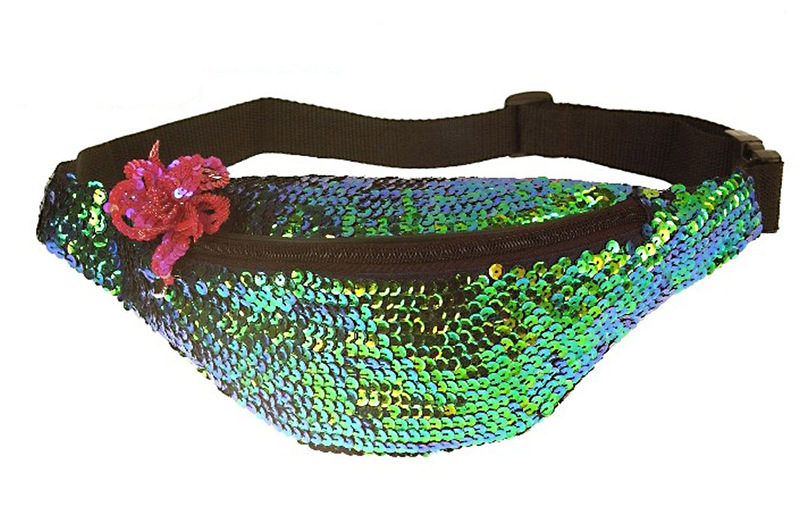 It looks AMAZING on you, me, it would totally 'swallow up'. But that's what I love about blogs - What's the others person's world, taste, aesthetic... and words?! Have you read Poppy King's book, by the way, seeing as you like her lipstick? I can't remember the name, something like Lessons of a Lipstick Queen, very interesting and inspirational read especially if you are thinking of setting up a small business. Oh and I just remembered about your cleansing comment on my post from last week - I did a Blessed Herbs cleanse a few years ago during Japanese summer when it was too hot to be doing much else. Nine days of just organic broth, juice, water, and their herbal clay cleansing stuff, but I don't think it made any difference!! You are one fascinating woman, Dusk! I loved reading this, and perusing your blog for your gorgeous sense of style. Will be back for more. with every post I begin to put you on a higher pedestal. You are like a goddess to me, really!!! So much to learn from you, the fearless energy and enthusiasm for life.. Please never never cut on the length of your enumeration.. I love to know every detail of your wondeful personality and life!!!! Thankyou so much for sharing.. Wish I can be even a bit of this fantastic, magnetic person you are!!! This is awesome. I particularly love the lip gloss bit. HA!